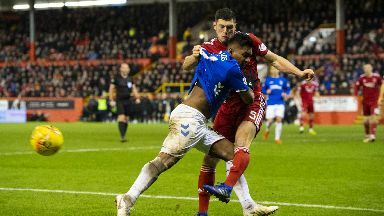 Rangers' striker and Aberdeen defender Scott McKenna were sent off at Pittodrie. 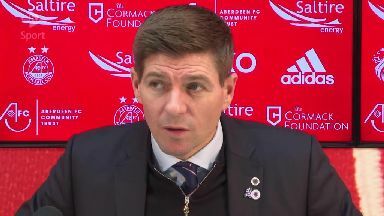 Rangers boss Steven Gerrard warned Alfredo Morelos to clean up his act if he wants to make it to the top. The Colombian went from saint to sinner as he fired two clinical finishes at Pittodrie - then saw red against Aberdeen for the third time this season. Morelos' double - which takes his tally to the season to 23 - helped seal a thrilling 4-2 win for Rangers which kept the Light Blues six points behind Premiership leaders Celtic. But former Liverpool skipper Gerrard says the 22-year-old will not be able to fulfil his dreams of playing in the English Premier League if he carries on getting himself caught up in the sort of needless clash that saw the striker and Reds defender Scott McKenna head for an early bath just after half-time. The pair had been embroiled in a running battle during the first half before both appeared to kick out at one another after a tussle on the deck. "I think for Alfredo to go to the next level or to improve he will have to channel his aggression," said the Rangers boss, who also saw James Tavernier net a penalty before Jermain Defoe's stoppage-time clincher ensured Sam Cosgrove's double counted for nothing. "I'll be honest, I haven't had the chance to analyse the incident back so I can't tell you if Scott deserved a red or whether Alfredo did. "But they've had a fantastic battle up until that point. Scott was physical with Alfredo, Alfredo was physical with them. "Two top players, but unfortunately they have both ended up with red cards. "Whether they deserved it I'll have to analyse it. If Alfredo is in the wrong then he'll deserve the red card. "He'll then be missing for two games and that's how he'll get punished because he hates missing games. "But I'm doing everything in my power to help the kid grow as a footballer and as a person. "I'm not going to take the physical side away from him because he'll get bullied out there against some strong physical players. "But for Alfredo to get to the next level and move on his career - and for people to trust him - he does have to channel it in the right way." 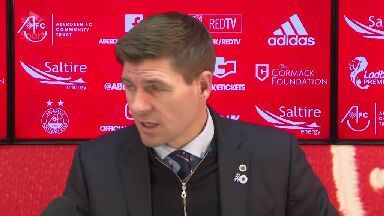 Rangers have now opened up a five-point lead on Derek McInnes' Dons but Gerrard is not convinced the title race is now a two-horse race with the Hoops. "We've won, we're delighted we've won," he said. "But Aberdeen are not going away, Kilmarnock are not going away. Hearts are getting stronger. "We can't rest on our laurels. We need to find consistency, keep growing and let's see what happens." McKenna gifted Gers their third goal when he handled in the box and his manager was frustrated the defender allowed himself to get sucked in by Morelos for his sending off. "My first thoughts with McKenna is that both red cards are right," said McInnes. "McKenna is maybe guilty with a bit of naivety with Morelos, as he's got previous with his antics. "When Morelos is on his game, like he was tonight, he's a star. But after he went off it felt like one-way traffic. I couldn't criticise my players' reaction - I'm disappointed with one or two of the goals but sometimes the movement of their front players causes you problems. "It's a sore one for us, going five points behind Rangers. There's still lots of football to be played. We'll use tonight as extra motivation."